As the weather warms up, more and more dragonflies finally are starting to emerge at Huntley Meadows Park in Alexandria, Virginia. like these Spangled Skimmers (Libellula cyanea) that I spotted yesterday at the park. Spangled Skimmers are pretty easy to identify, because they are the only dragonflies in our area that have the both black and white “stigma” on the front edges of their wings. The adult male is blue, but immature males have the same coloration as the females, so you have to look closely to determine gender. The first image, for example, shows an immature male, while the second image shows a female. If you examine the extreme tip of the abdomen (what I used to call a “tail”), you can see some differences. You may also note that the terminal appendages match for the first and third images, both of which show males. 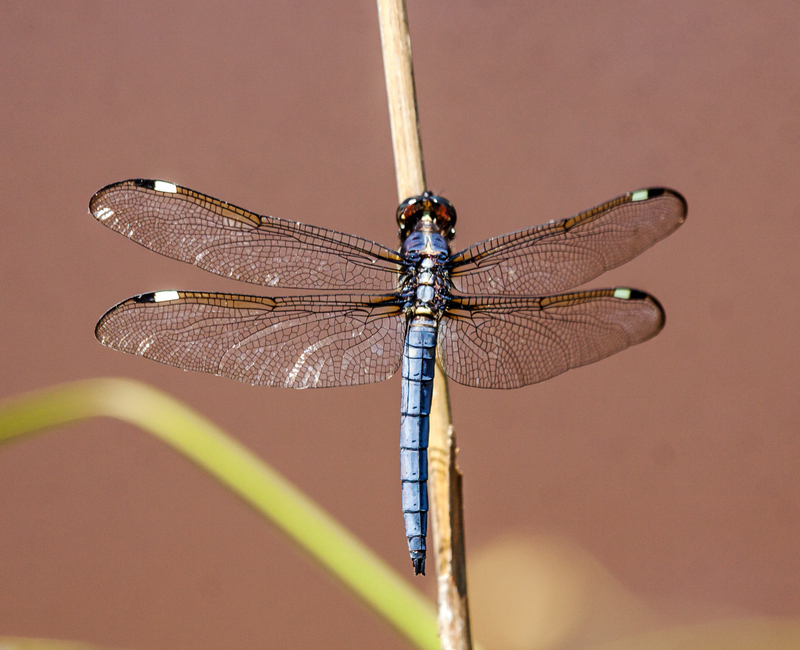 If you want to learn more about Spangled Skimmers, check out this page from the Dragonflies of Northern Virginia website. The website is a wonderful resource for anyone interested in dragonflies, not just for folks who live in our area. I didn’t really intend to photograph birds this weekend and had my macro lens on my camera. 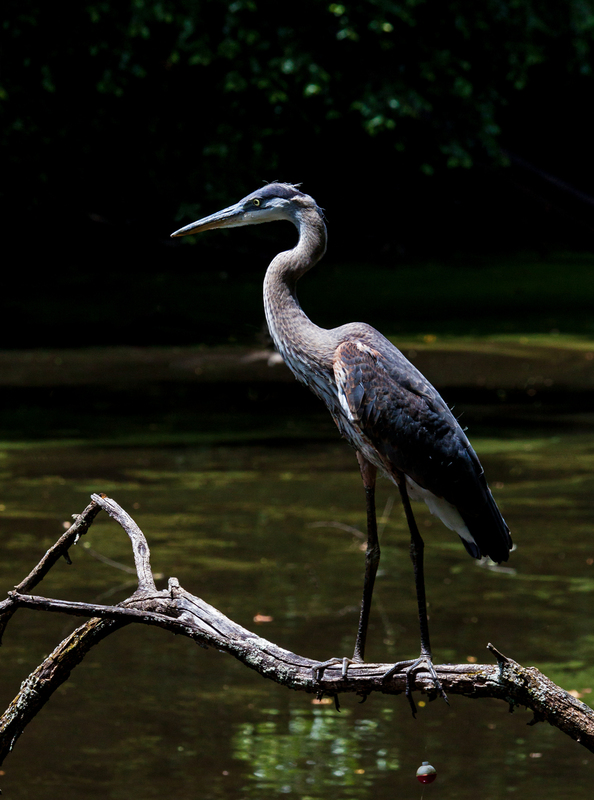 As I was walking around Hidden Pond Nature Center, however, I came face to face with a Great Blue Heron (Ardea herodias) and actually had to back up a little to take this shot. My macro lens is a 180mm Tamron and can serve pretty well as a telephoto lens in certain circumstances, though normally when I am planning to photograph birds I will use a longer lens. Sometimes you just have to shoot a subject with the lens on your camera at that moment. I had a zoom lens in my camera bag, but suspect that the heron would have flown away before I would have been able to switch lenses. 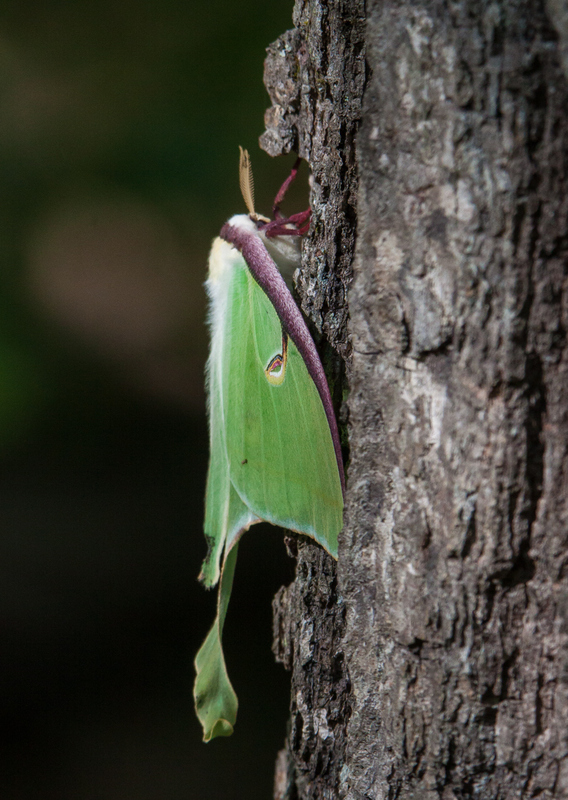 As I was wandering through the woods of Huntley Meadows Park last Friday, I came upon a giant Luna Moth (Actias luna) that seemed to be almost as big as my hand. 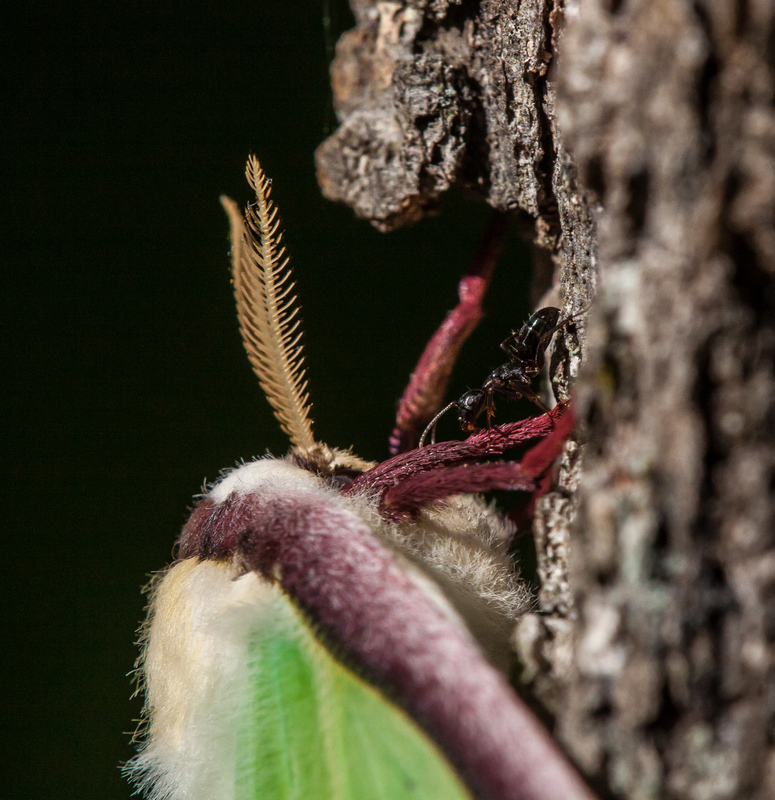 I was trying to get a close-up of its really cool antennae when an ant crawled onto one of the moth’s legs. 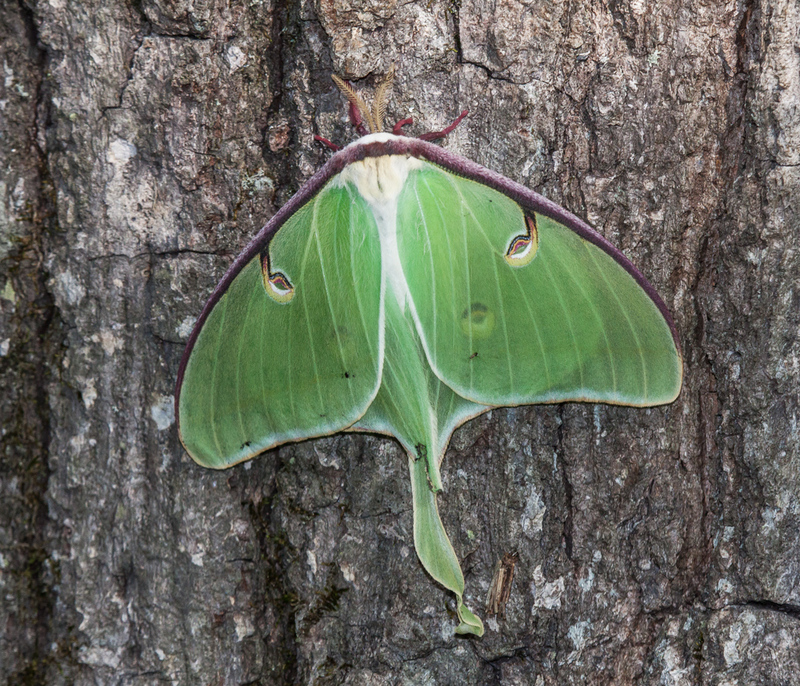 I thought the ant might become lunch until I learned that Luna Moths don’t eat—they have no mouths and they only live for about a week as adults, with a sole purpose of mating, according to a Fairfax County Public Schools webpage. 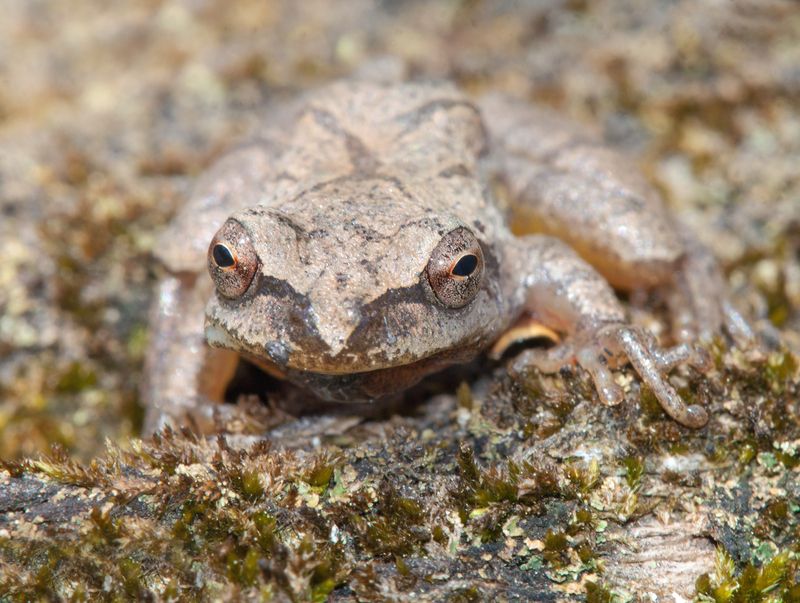 The high-pitched calls of the Spring Peeper frog (Pseudacris crucifer) are one of the harbingers of spring for many of us, but have you ever actually seen one of these diminutive songsters? Even when there was a loud chorus of Spring Peepers, these tiny frogs seemed to be invisible. 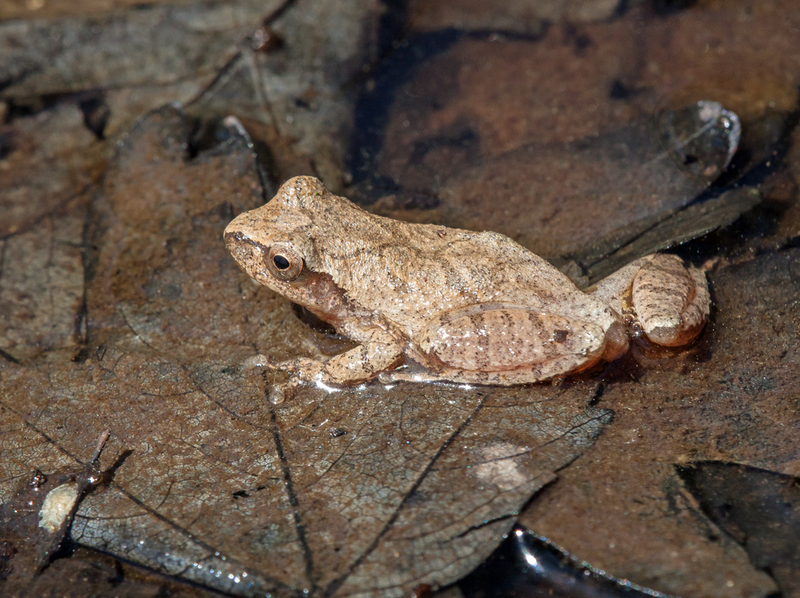 Last Friday, while hunting for dragonflies at Huntley Meadows Park with my friend and fellow photographer Walter Sanford, we almost literally stumbled upon a Spring Peeper near the edge of the water. As we were photographing one peeper, another jumped into view. 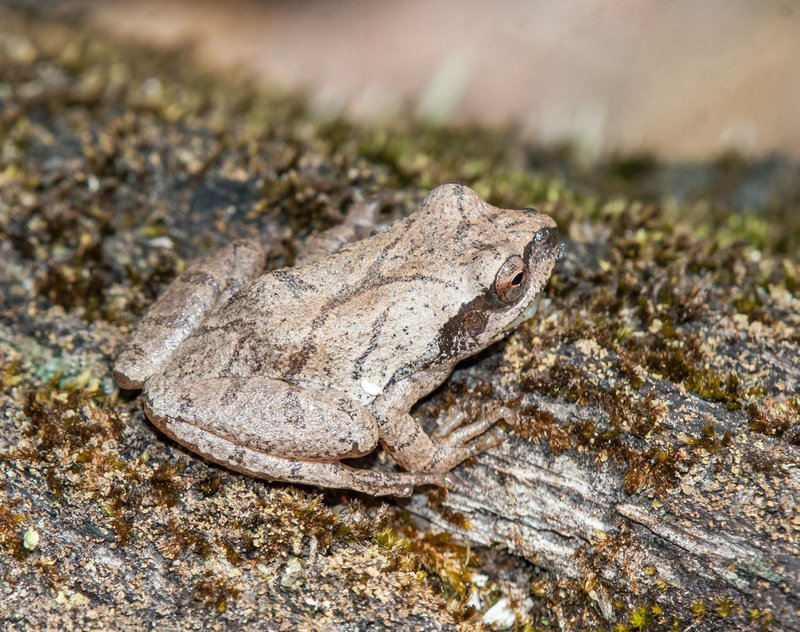 The thing that struck me most about the spring peepers was how small they are, a bit over one inch and certainly less than two inches in length (about 3-5 cm). The other thing that I noticed was how low they were to the ground—it was tough getting a good viewing angle even when my elbows and knees were submerged in the marshy soil. Here are three of my favorite shots of the Spring Peepers in a couple of different settings. You can’t help but notice how well the frog blends in with its surroundings, which helps explain why I had never been able to spot one previously. My one regret is that we never heard a peep from the frogs. Perhaps next time I will be able to get a shot of a Spring Peeper with its vocal sac inflated. Do you find yourself shooting the same subjects with the same lens all of the time? Sometimes it’s fun to try to try to photograph a subject with the “wrong” lens. Conventional wisdom tells me to use a telephoto lens to photo birds, a macro lens to photograph insects, and a wide-angle lens to photograph landscapes. Following that wisdom, I had my macro lens on my camera this past weekend when I traveled with some friends to Meadowlark Botanical Gardens in Vienna, Virginia, where I anticipated that I would be shooting flowers and insects. 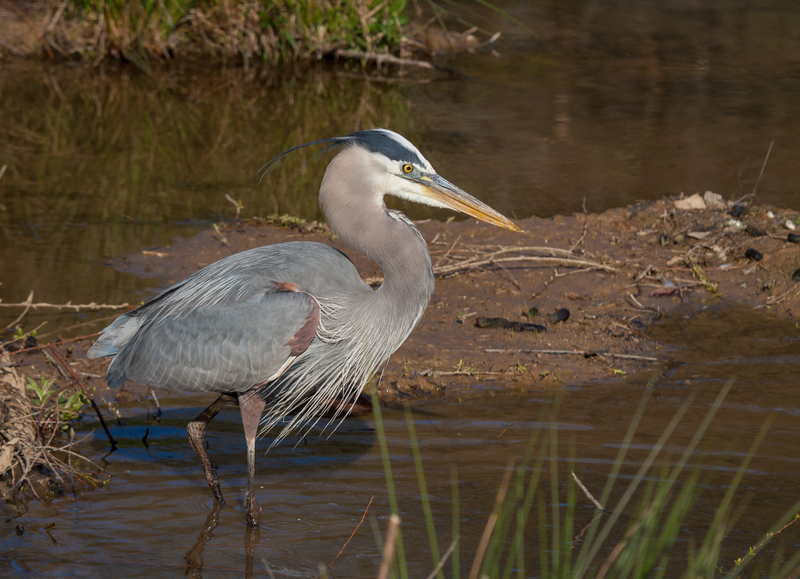 As I was walking around a small pond, hoping in vain to spot some dragonflies, I suddenly came upon a Great Blue Heron (Ardea herodias). From a distance, vegetation at the water’s edge had blocked the heron from view. 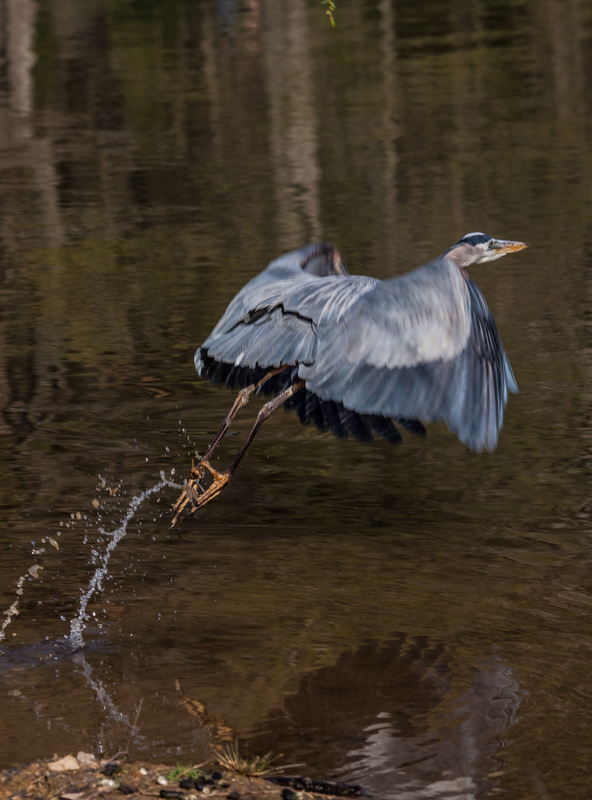 With the heron right in front of me, I had two choices—I could try to change to the 70-300mm lens that I had in my camera bag to gain some additional reach or I could make do with my macro lens. I chose the latter option. My macro lens is a 180mm Tamron lens. It is slow and noisy when focusing at close distances, but when I pay attention to my technique, I have taken some pretty good macro shots with it. How would it do with a bird? I have gotten used to photographing birds with a 150-600mm Tamron lens that has a built-in image stabilization system and, obviously, lets me zoom in and out. 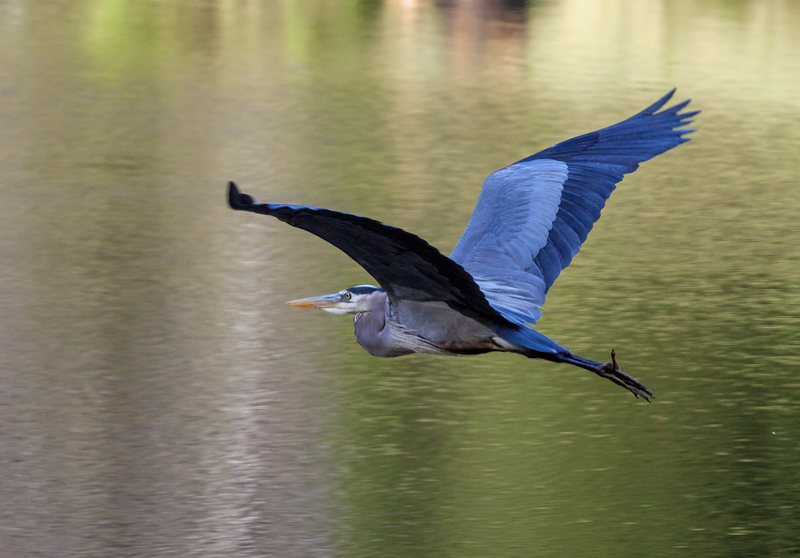 My macro lens lacks both of these capabilities, so I really did not know how well it would fare, particularly when I tried to capture some in-flight shots of the heron—I was pretty sure the heron would be spooked by my presence and I proved to be right. 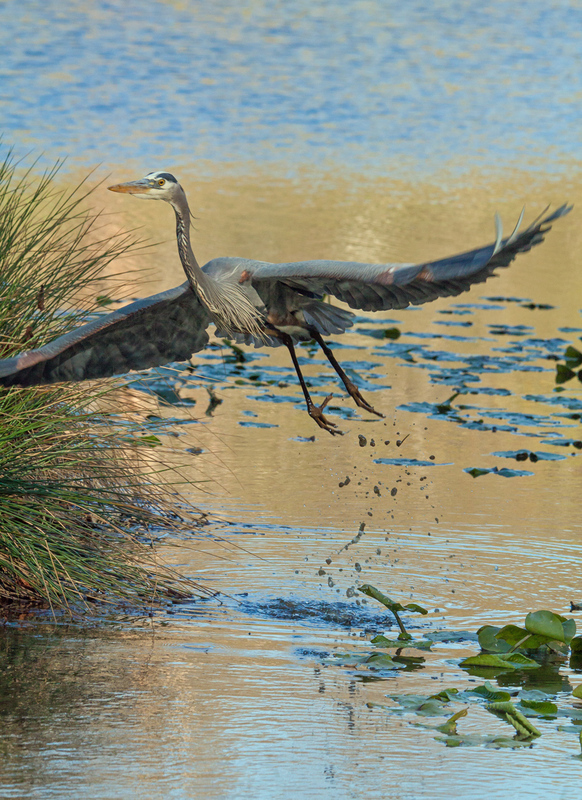 Well, I ended up following the heron around for quite a while and captured images of it at several locations, including in the air. It worked out remarkably well. In some ways, it was even more enjoyable shooting with a prime lens than with a zoom lens, because I could concentrate better on tracking and framing the subject—my decision process was simplified when I had to zoom with my feet. I particularly like the first photo below. The lighting at that moment was very unusual and the colors are so vivid that a friend asked me if I had used some kind of art filter. With the exception of a few minor tweaks in post-processing, however, the image looks like it did when I first looked at it on the back of my camera. So what did I learn? I have a greater appreciation of the capabilities of my macro lens and realize that I can use it for more than just macro shots. I think that I also appreciate better the experience of shooting with a prime lens—I think my zoom lenses sometimes make me a bit lazy and sloppy. I look forward to trying to shoot some more little experiments like this of thinking outside of the box and shooting more subjects with the “wrong” lens. 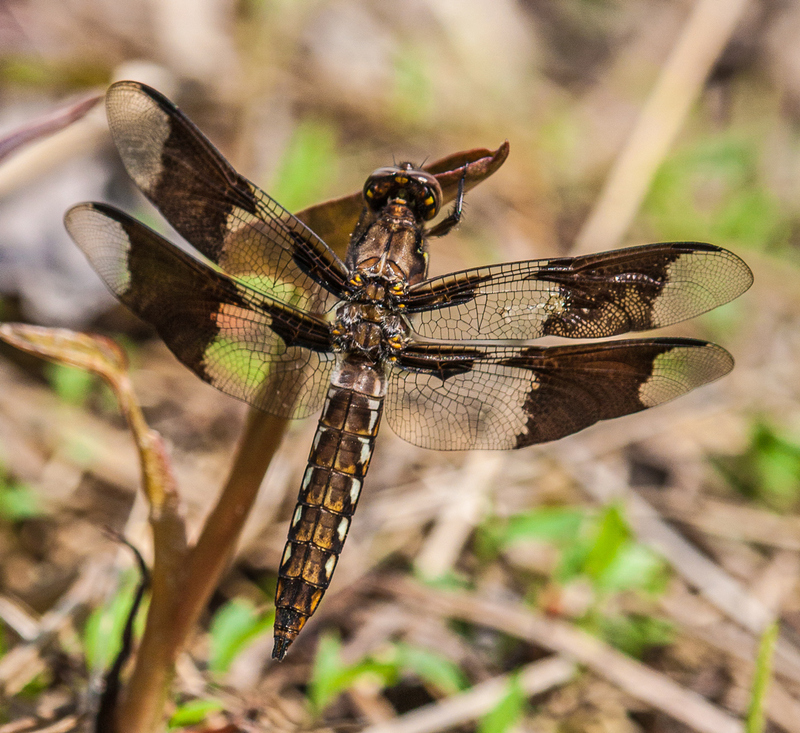 Unlike many species with “common” in their names, Common Whitetail dragonflies (Plathemis lydia) actually are abundant and frequently seen during their peak season of June through September. In mid-April, however, they are much more rare and I was thrilled to spot this newly-emerged female this past Saturday at Huntley Meadows Park. 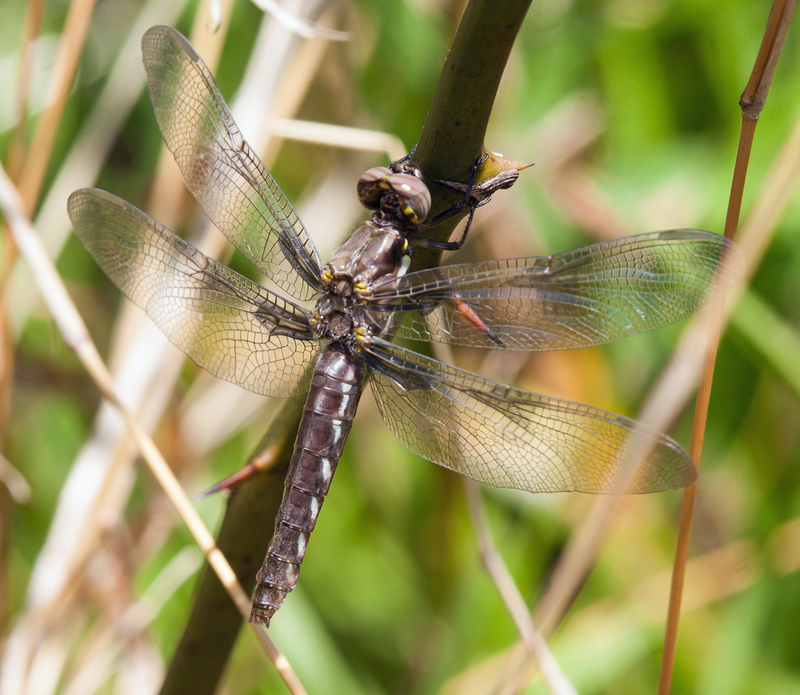 Members of this dragonfly species often perch on the ground, making them a bit difficult to photograph when they are in in area of heavy vegetation. This individual made it a easier for me to get some shots by perching almost vertically. My 180mm macro lens let me get some close-up shots without having to move too close. 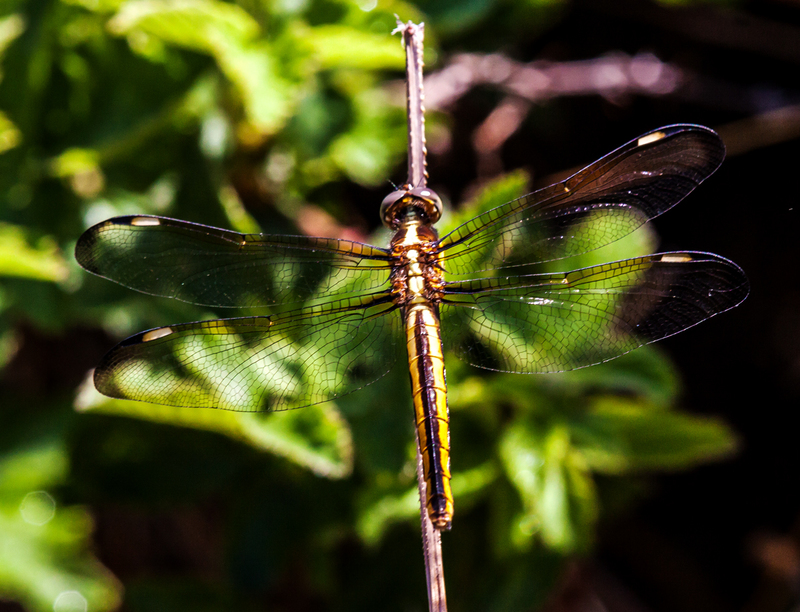 I really enjoy trying to get somewhat “artsy” macro shots of dragonflies. 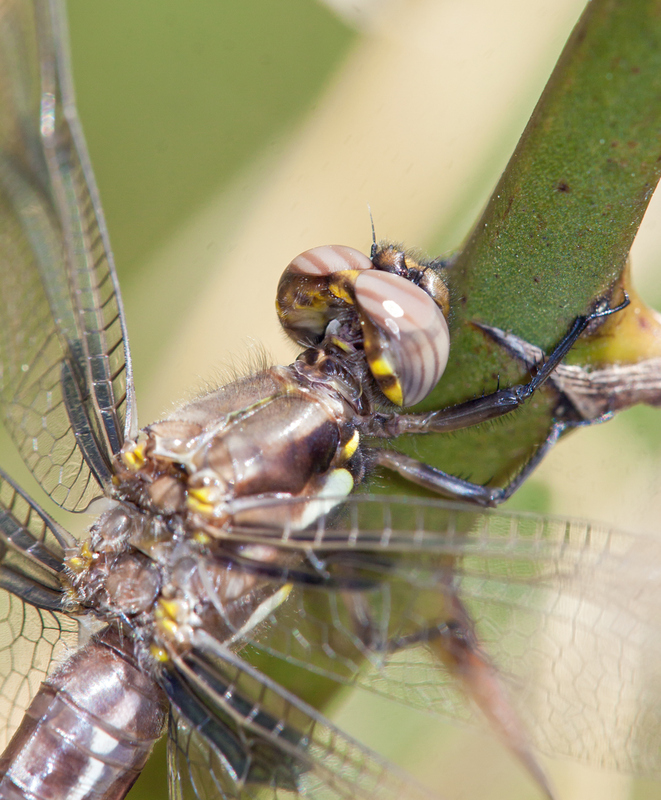 Mature female Common Whitetail dragonflies have distinctive dark patches on their wings. This dragonfly’s wings are mostly clear, which is why I judge that she is a teneral, i.e. she only recently underwent the transformation from living in the water as a nymph and emerged as an air-breathing acrobatic dragonfly. For comparison purposes I have included a photo from May 2014 of a fully-developed female Common Whitetail in which you can see the wing patches. 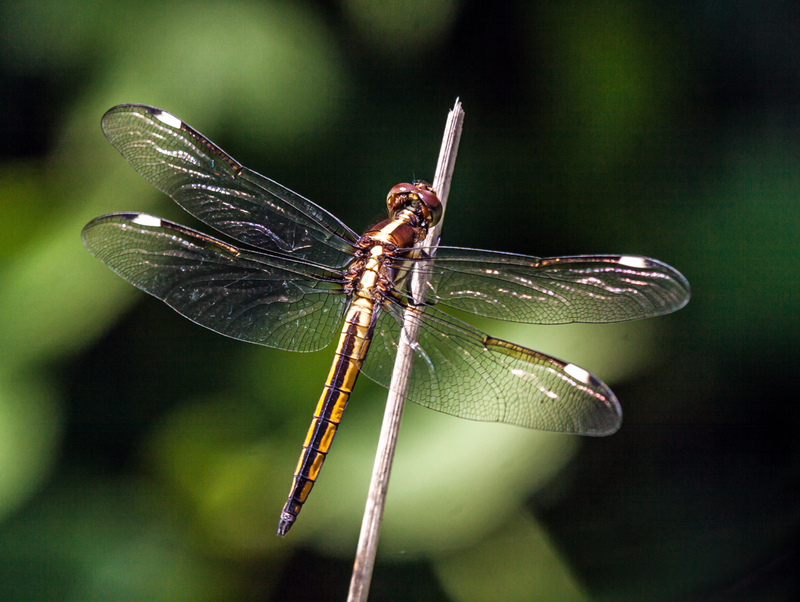 Common Whitetails are one of the first dragonflies to appear in the spring and they are around until late in the fall. I find them to be beautiful, especially this early in the season when they do not have to share the stage with very many other dragonflies. I have captured images of many beautiful dragonflies in the past, but I am not sure that any of them can quite match the spectacular colors and pattern of this female Springtime Darner dragonfly (Basiaeschna janata) that I photographed this past Friday at Huntley Meadows Park in Alexandria, Virginia. 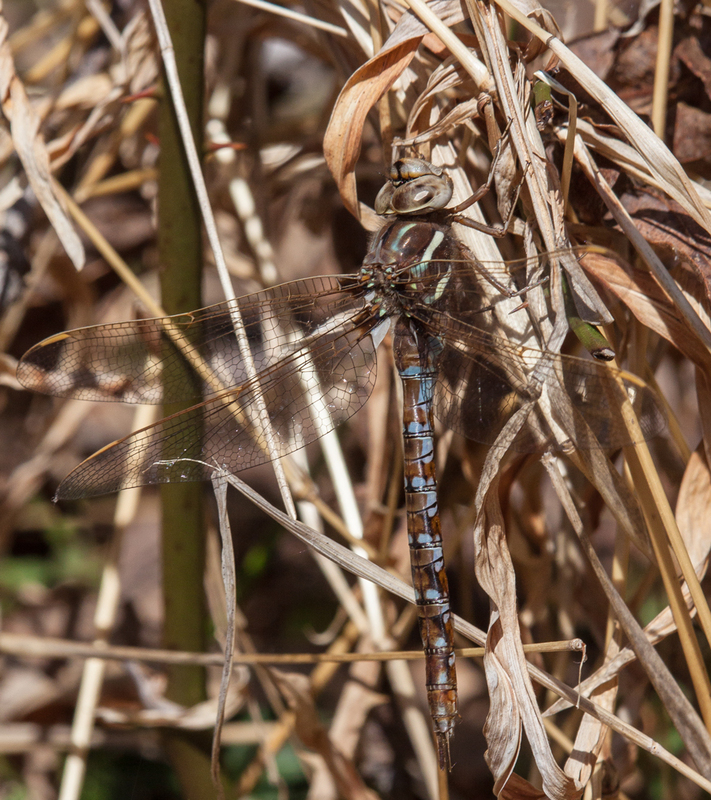 Springtime Darners appear to be be pretty uncommon at our park—they are few in number and are active for only a very limited period of time early in the spring. 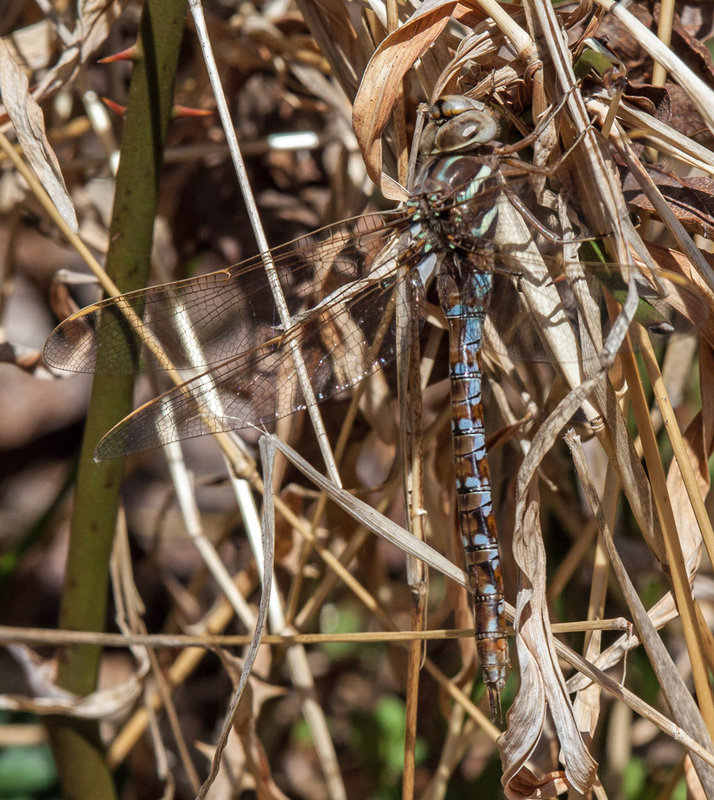 Last year, fellow photographer Walter Sanford and I spotted the first known Springtime Darner at Huntley Meadows Park, but it was only a brief encounter and we never again spotted one. Walter and I were determined that we would do better this year. Already this spring, he and I have separately explored likely locations for hours on end without success. On Friday, we decided to work together as a team. Our experience has shown that having an extra set of eyes really helps in spotting and tracking our elusive flying subjects. After several hours of searching, we finally caught sight of a dragonfly in flight. It flew about a bit and then it finally perched—our moment had arrived for indeed it was a Springtime Darner. Springtime Darners will generally perch vertically on vegetation low to the ground. My view of the dragonfly was obscured, but fortunately Walter could see it and began to compose some shots. I stood still for what seemed like an eternity, fearful of spooking the dragonfly, but finally was able to move forward to a spot with a somewhat clearer view of the dragonfly. The only problem was that I couldn’t pick out the dragonfly amidst all of the vegetation. I was shooting with my 180mm macro lens, which meant that I couldn’t simply zoom in to get a better view. Walter patiently described for me the specific location and I took some initial shots without actually seeing the dragonfly. Eventually I was able to see what I thought was the dragonfly and captured a few shots before it flew away, though I never had a really clear view of it. Although we searched and searched, we were not able to relocate the dragonfly, nor did we see another Springtime Darner. I was not very hopeful when I downloaded my images from my memory card to my computer and was surprised when I saw that somehow I had captured some of the beautiful colors and patterns of the Springtime Darner. Normally I like to try to isolate my subjects from the background and the background in these two images was unavoidably really cluttered, but I’m really happy with them. I am happy with the images, but not quite satisfied—I’ll be out again soon to search for more Springtime Darners, hopefully including a male, as well as other dragonflies and damselflies. My dragonfly season has only just begun.